Welcome to our collection of stones and crystals. 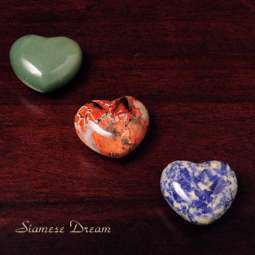 Our heart stones (which are acutally made from crystals such as Rose Quartz, African Jade, Sodalite, and more) have been bestsellers for many years now. Our Feng Shui stones are a more recent addition to our web site and we think you will love them, too. Please check back frequently as we will be getting more stones and crystals in soon.